Shanghai, China— In mid-November 2013, CSM (Castic-SMP) exhibited at Texcare Asia. The stand featured the Milnor large capacity Open-Pocket Washer-extractor (48040 F-series). This machine features a 125kg cylinder capacity, ideal for most linen types, including rugged items like tents and dust control mats. Also, a Pass-through Dryer, up to 158 kg capacity which forms an integral part of an automated batch laundry processing system, alongside a PulseFlow® batch washer or continuous batch washer, an extraction system, and transport conveyors. CSM offered a comprehensive overview of its strategy arising from the new company motto “Texcare solutions that work for you” to a receiving crowd of commercial laundry professionals and was pleased with the excellent customer response in Texcare Asia 2013. “This year we have a more prominent presence with a larger stand. In this way, we can demonstrate our solutions that comprise of individual machine as well as sizable processing equipment. 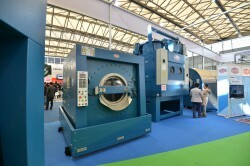 We showcase the most sophisticated soil sorting and rail systems provided by E-TECH and the highly efficient finishing equipment from Chicago Dryer, which complements the production ability of (Milnor's) PulseFlow® Technology seamlessly”, said David Liu, the General Manager of CSM. “Consumer behavior is adapting to higher standards for laundry service. We have received a lot of inquiries from high-end hotels, institutions and business owners that are looking for turn-key solutions with reliable and customer-oriented support in a variety of areas, including design & customization, installation and after sales maintenance which are tailor-made to their needs”, said Johnson Fok, Sales Director of CSM. To read more about CSM's Texcare stand, visit CSM's website.